Here's the best wedding photo booth in Orange. 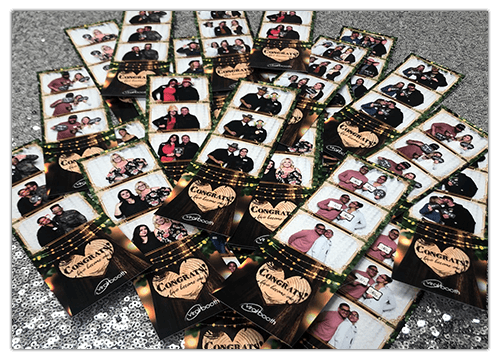 The Viral Booth All-Inclusive Package gives your guests unlimited pictures and prints and keeps them laughing all night long. "The best photo booth ever! I have been to so many parties and have also gone through other photo booths but this one is top notch compared to the rest. The photo area is so big we were able to fit a lot of people in one photo. Plus, the quality of the photos is so nice." Hey Orange! 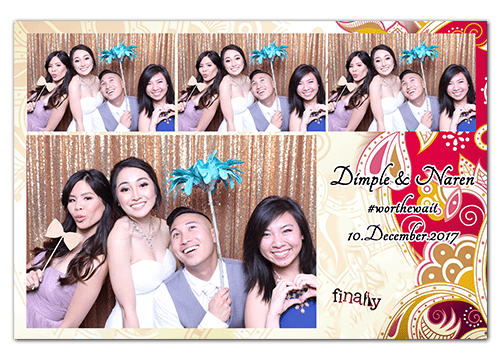 Here's the affordable, all-inclusive wedding photo booth package that is going to be the hit of your reception. The features below are all included in the package. Need more? Add on services like the super-popular black & white prints. 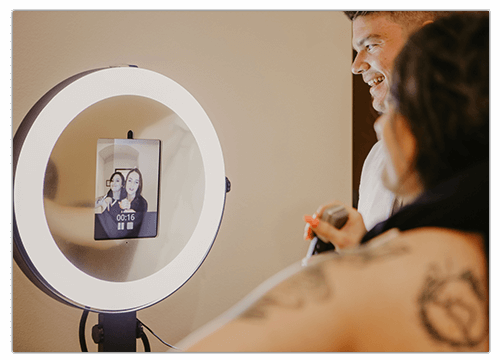 The open air photo booth is the right choice for weddings because it can go anywhere from Orange, CA venues and restaurants to outdoor locations and even homes. The open foot-print makes it easy for large groups to take pictures together but it's intimate enough for the bride and groom to take beautiful photos together. 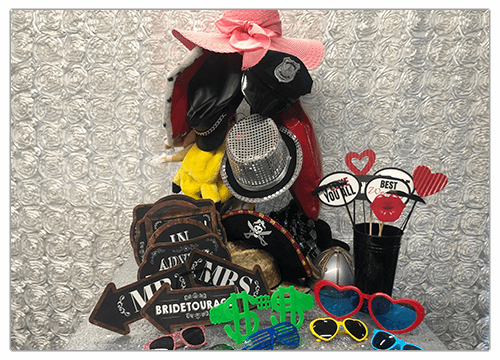 Add a table full of fun props and one of our beautiful backdrops to match your wedding colors and the open air photo booth will have everyone laughing and having fun your entire reception. 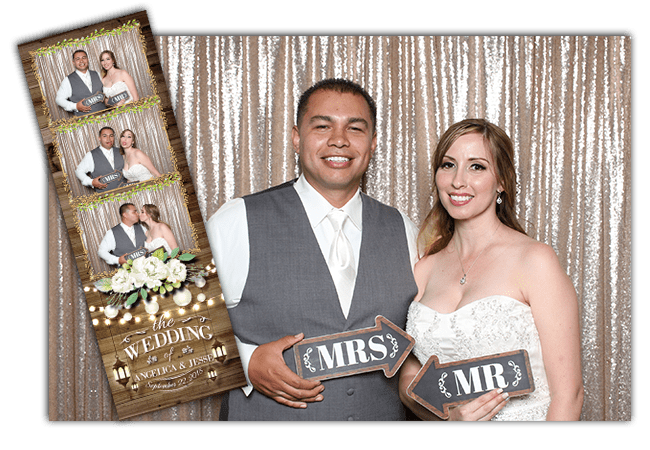 The Viral Booth wedding photo booth for Orange, CA prints unlimited 2x6 prints so quickly that your guests will be coming back over and over to get more copies for their refrigerators. Our professional photo printers create the beautiful, high quality prints and our DSLR cameras make everyone look amazing. Plus, we offer dozens of photo strip layout designs in colors that will match your theme. You can also upgrade to the 4x6 or even 5x7 prints to create a beautiful keepsake for your guests. 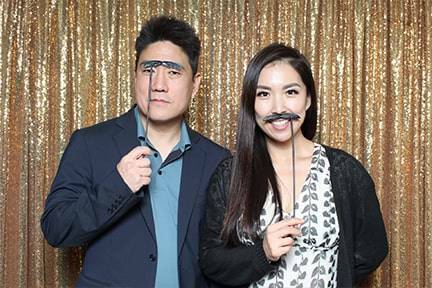 Photo Booth Props Make it Fun! Props are the most popular part of the photo booth experience! We bring along more than 50 hats, glasses, stick props, funny wedding signs and more! 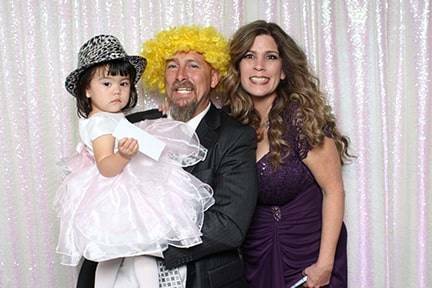 All of our props are super clean and will make your guests look as funny as they want to be in the pictures. Have a special theme for your Orange, CA wedding? 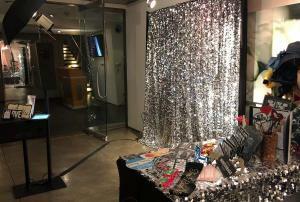 We've got lots of theme props, or, we can work with you to create the props for your wedding (extra fees may apply). 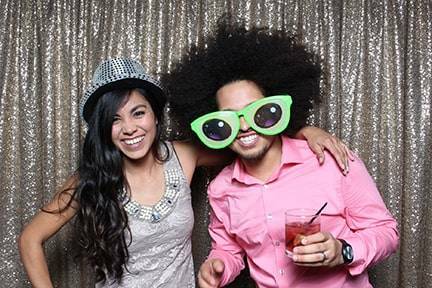 Animated GIFs are included in the package for our Wedding Photo Booth Rentals in Orange, CA! A GIF is created from the pictures taken during each of your guests photo sessions. The hilarious looping videos will be the talk of your reception. Then, everyone can email and text their GIFs to themselves and their friends right from the photo booth. 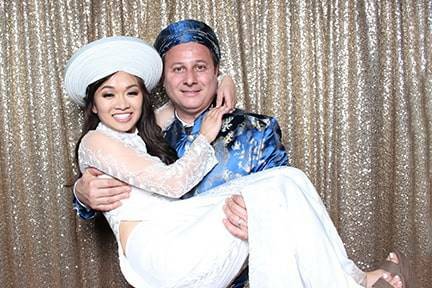 Social media sharing is a must for your wedding photo booth. That's why we include it in the package. As soon as the pictures are taken, your guests can text and email their pictures and share them on Facebook and Twitter. 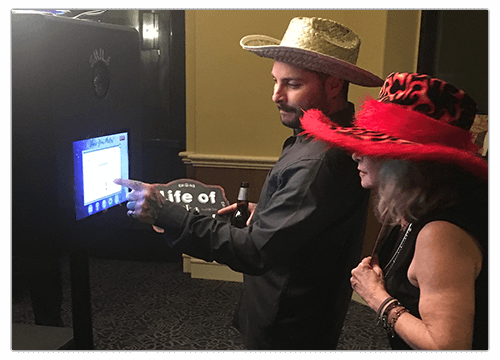 Even folks that couldn't make it to the wedding can see the photo booth shots on social media! 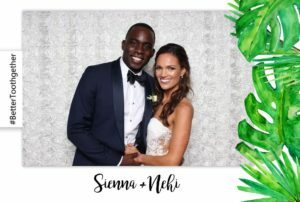 The Wedding photo booth rental in Orange, CA includes a gorgeous 20-page scrapbook that guests fill with notes and photo strips throughout the reception. The photo booth host assembles the book through the event and presents it to the bride and group at the end of the reception. It's so much fun to page through the scrapbook, check out the photo strips, read the heart-felt messages from family and funny jokes from friends. 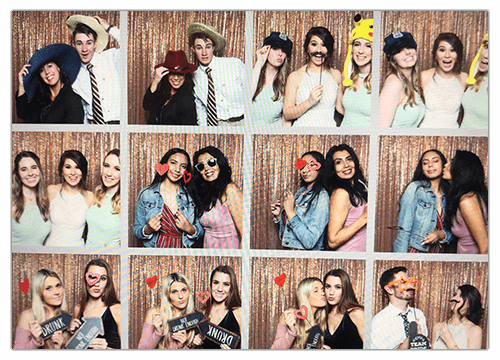 All of your photo booth pictures stay safe and are easily accessible thanks to the online gallery included in the wedding photo booth orange package. The bride and groom receive a link to the gallery about a week after the reception. The pictures can be downloaded to your computer or shared right from the gallery. Take on or take them all! 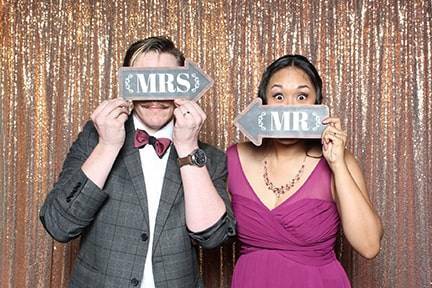 These upgrades are a great way to personalize your photo booth. Ask us for prices when you request a quote. Orange County Mining Company was a gorgeous location for Angelica and Jesse's wedding last fall! The sweeping views of Orange, CA and Santa Ana, CA made a spectacular backdrop for their romantic day. 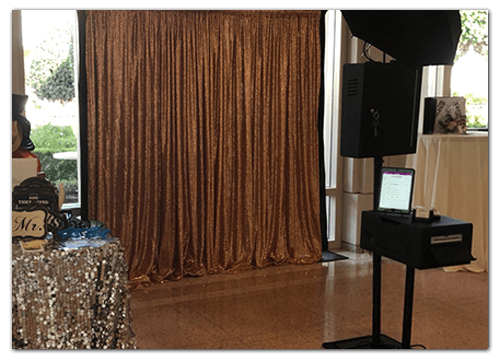 The Viral Booth, with it's sleek open design and beautiful champagne sequin backdrop, fit right in with the golds and browns of the reception ballroom. 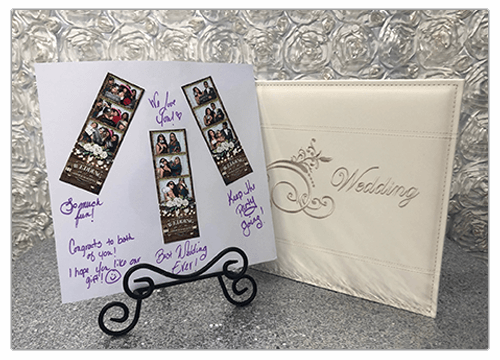 Angelica and Jesse chose the Rustic Lantern 2x6-inch photo strip design with space for 3 photos. The bride and groom and their guests had a ball playing with all the photo booth props and taking hundreds of pictures all night. Guests also took advantage of the social media-equipped booth and texted, emailed and posted their photos on Facebook and Twitter. At the end of the evening the Viral Booth host presented Angelica and Jesse with a scrapbook full of wedding photo strips and notes from their guests. They also received an online gallery with every picture taken in their wedding photo booth. We've taken over a million photo booth pictures over the past 7 years and love sharing some of them here. 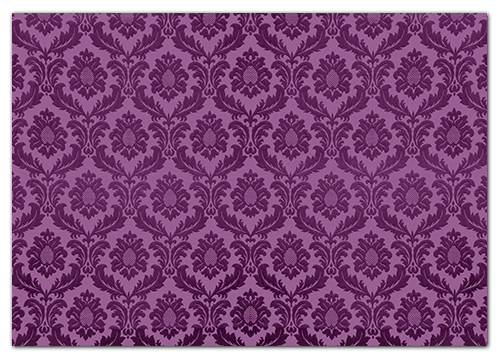 Looking for your booth photos? Email us at fun@viralboothoc.com.